This recipe combines two of my favorite ingredients into something that’s so much more than the sum of its parts. Meaty mushrooms and creamy eggs are the canvas for a spicy, savory sauce that coat these unique parcels. Toasted pine nuts add extra depth. You can have these for brunch, or prepare them for a light dinner like I do. They’re #uglydelicious. 1. Prepare the sauce: stir the soy sauce, oyster sauce, water, and chili garlic sauce together in a small saucepan and set aside. 2. Remove and discard the stems from the portobello mushrooms. Scrape the gills from the underside of the caps and discard the gills. Thinly slice the caps. 3. Whisk the eggs and water together in a bowl. 4. Heat a medium nonstick skillet over medium-high heat. Add 1 teaspoon of the oil. Pour about 1/3 cup of the egg mixture into the pan, tilting the pan so the egg coats the bottom, and cook until the bottom of the omelet is set, about 1 minute. 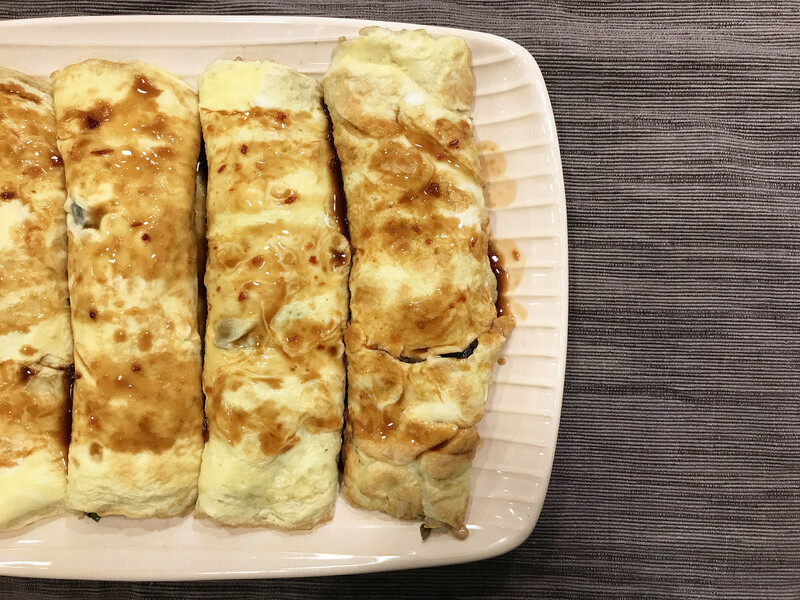 Slide the omelet onto a plate and set aside. Repeat with the remaining egg mixture, adding oil to the skillet as needed, to make six omelets. 5. Heat the sauce over medium heat until hot, about 3 minutes. Set aside and cover to keep warm. 6. Heat a wok over high heat. Add the remaining 1 teaspoon oil. Add the green onions, ginger, garlic, and all the mushrooms and stir-fry until the mushrooms are tender, about 4 minutes. Add the snow peas, pine nuts, soy sauce, and oyster sauce and cook until the snow peas are tender, about 2 minutes. 7. To serve, spoon one-sixth of the mushroom mixture onto the bottom third of one of the omelets. Gently roll the omelet up like a burrito, leaving the ends open and placing on a serving platter seam side down. Repeat with the remaining omelets and filling. Spoon the sauce over them and serve immediately. Okay, okay. I know this larb isn’t even remotely authentic, but these days I sort of want to larb everything. Chicken larb? Check. Lamb larb? Check. And this cauliflower larb is surprisingly delicious, albeit much lighter than its meaty counterparts. Make this for a light lunch or dinner — you won’t miss the meat. 1. Preheat oven to 425F degrees. Toss cauliflower with oil on a rimmed baking sheet. Roast, tossing occasionally, until tender and well browned, about 50 minutes. Let cool slightly; chop into pea-size pieces. Transfer to a large bowl. Add chiles, lemongrass, lime leaves, fish sauce, and lime juice; mix. 2. Meanwhile, place rice in a small skillet and set over medium heat. Toast, shaking pan frequently to keep rice moving, until evenly browned, about 10 minutes. Transfer to a plate; let cool. Grind in spice mill to a powder similar to cornmeal. 3. Toss green onions, cilantro, mint, and toasted rice powder into cauliflower mixture; season with salt. 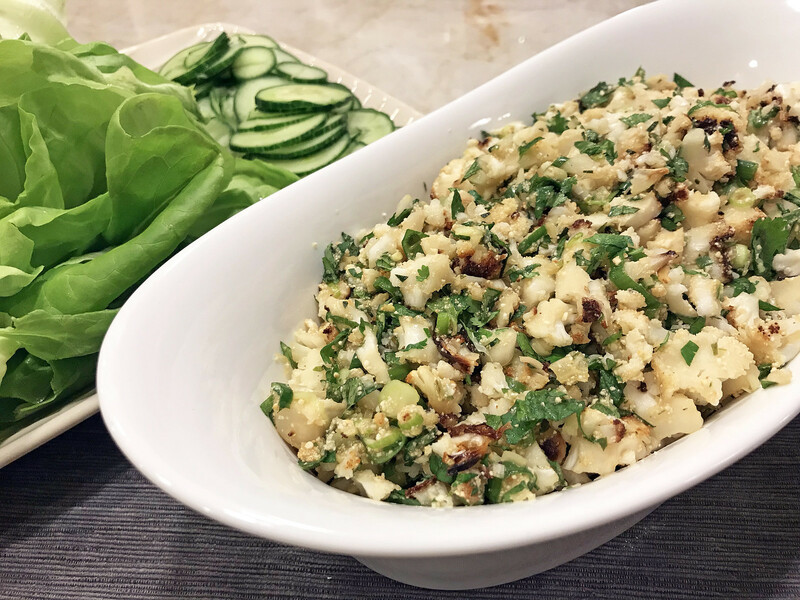 Serve with cucumber and lettuce to make lettuce cups. Sick of butternut squash yet this season? Me neither. But seriously, it doesn’t have to be all butternut squash soup all day. 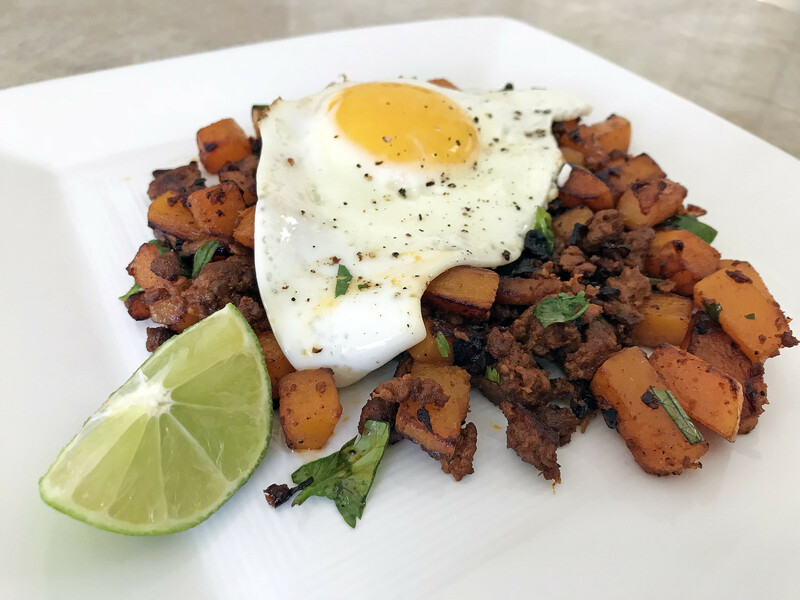 Transform the humble squash into a powerhouse with this hash, decked with meaty chorizo and brightened with lime. And put an egg on it, obvs. Breakfast is served. 1. Heat 1 tablespoon oil in a large heavy skillet (preferably cast iron) over medium-high. Cook chorizo, breaking up into small pieces, until browned and cooked through, about 7 minutes. Transfer to a bowl with a slotted spoon; reserve skillet with fat. 2. Add butternut squash and onion to reserved skillet and cook over medium-high, adding more oil if needed and stirring occasionally, until golden brown and tender, about 15 minutes. Stir in chorizo and season with salt. Squeeze a lime wedge over and top with cilantro. 3. In the meantime, heat remaining tablespoon oil in a medium skillet over medium heat. Fry eggs sunny-side up until whites are cooked through and yolks are still runny, about 5 minutes. Season with salt and pepper. 4. Divide hash among four plates and top each with an egg. Serve with additional lime wedges for squeezing over. Salty, sour, and a little bit sweet, this Thai-inspired salad is a pinch to make and goes perfectly with all manner of grilled meats (or even on its own, really). 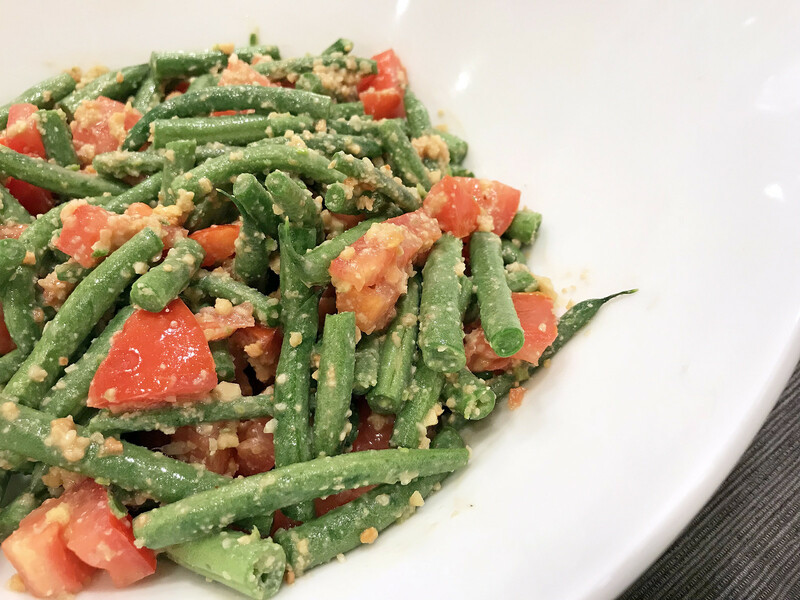 I tried many variations of long bean salads in Chiang Mai a couple of years ago and the peanut and lime-flecked ones similar to this one remain my favorite. 1. Place the garlic, salt, peanuts, anchovy, chile, and sugar in a food processor and process to a paste. Transfer the paste to a bowl and stir in the lime juice and fish sauce. Add the chopped tomatoes and green beans, mix, and serve. I served this with Iranian barbari bread to soak up the creamy tomato sauce, but any flatbread will work just fine. 1. Heat oil in a medium skillet over medium. Cook garlic and rosemary, stirring frequently, until garlic is golden brown and rosemary crisps up slightly but isn’t browned, about 30 seconds for rosemary and 2 minutes for garlic. Transfer rosemary to a plate. 2. Add chickpeas, tomato paste, and paprika to skillet and cook, stirring often, until coated, about 2 minutes. Mix in cream, season with salt and lots of pepper, and bring to a simmer. 3. 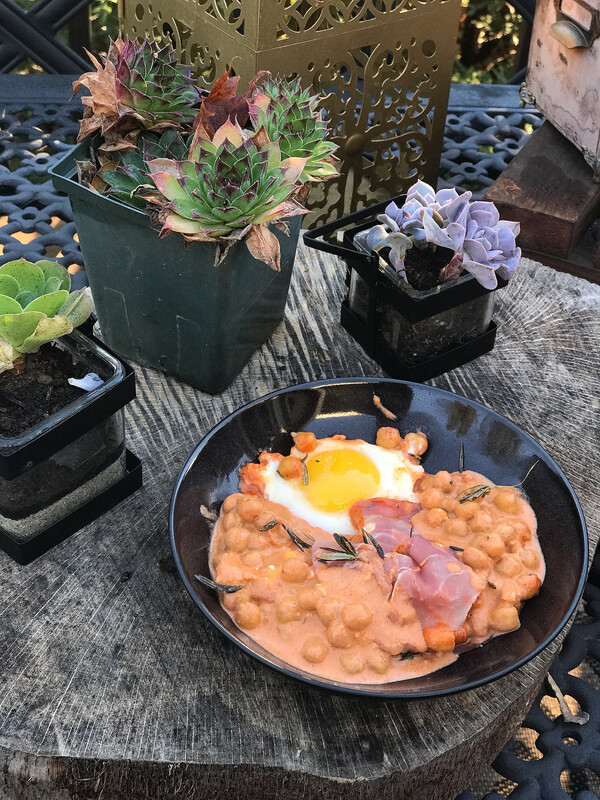 Crack eggs into chickpea mixture and season them with salt. Cover and cook until white parts of eggs are set but yolks are still runny, about 3 minutes. Remove from heat and drape prosciutto around eggs. Crumble rosemary on top. Serve warm with flatbread.